All our customers will be pleased by an additional statutorily required revocation right concerning a 3 month 'money-back' guarantee on all our articles. After receipt of the goods, the invoice price will be transferred to the credit of your bank account. Consumers have a statutory revocation right of 14 days. In cases of an effective revocation, the goods and the payment are to be returned by the parties and any usufruct obtained (e.g. interest charges) is to be returned. Should the goods received by you from us as well as any usufruct (e.g. user advanatages or benefits) not be capable of return or relinquishment in whole or in part, or only in poor condition, you will be required to indemnify us for the replacement value. In regard to the resultant poor condition of the goods, and for the advantages and benefits obtained, you will only be required to indemnity us for replacement value, when the use or resultant poor condition results from activities exceeding the mere 'verification of the characteristics and the functioning'. The 'verification of the characteristics and the functioning' means the testing- and trials conducted on the relative goods, as is possible and usual when purchasing goods in a retail shop. Goods capable of being returned by parcel can be returned at our expense and peril. Other goods not capable of being returned by parcel will be collected from your postal address. Obligations for making payments are to be fulfilled within 30 days. The 30 day time period commences for you upon the date of the sending of the statement of revocation, or the date of the return of the goods, and for us upon the date of receipt. End of the explanation of revocation rights. All deliveries, services and offers of our Company are made on the basis of these General Conditions of Business. The descriptions of the products in our Online Shop represent no legally binding offer, but are merely a non-binding Online Catalogue of products. When you click on the button „buy now“, you enter into a legally binding order for the goods placed in the shopping basket. A confirmation email message will be sent to you confirming receipt of your order together with the acceptance of your order immediately after your sending of the order. This confirmation email message represents the conclusion of a contract of purchase and sale between us. All process quoted by us are inclusive of value-added tax, unless otherwise expressly mentioned. Delivery charges will be added to the total of the prices of the products in the shopping basket. You can obtain more information on the amount of delivery charges here. Forms of payment accepted are advanced payment, credit card, PayPal, or over-the-counter cash payment in our Offices. Your credit card will be debited upon the conclusion of the order. 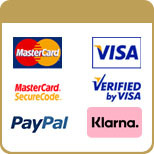 Your PayPal / credit card account will only be charged upon the completion of your order. Direct transfer with online banking (PIN and TAN). TÜV-approved payment system. There are no reminder or money collection charges, because payment was made before delivery. The Company is under legal obligation to deliver the goods or services immediately upon receipt of payment. The place of fulfilment is the place of the registered office of our Company. Recourse claims as defined in Art. 12 of the Austrian Federal 'Produkthaftungsgesetz' (Product Liability Legislation) are excluded hereunder, unless the claimant entitled to recourse can show that a fault was caused within our sphere of activities, and that we are culpable of gross negligence. All goods delivered by us under reservation of ownership rights remain our property until full payment is made. With all goods delivered under reservation of ownership rights, the customer must now, at this moment in time, cede to us all his/her/its claims receivable from third parties in connection with the goods in question delivered by us. The Austrian law is applicable hereto. The application of the United Nations Convention on contracts for the international sale of goods is hereby expressly excluded. The contractual language is German. The contractual parties agree on Austrian inland jurisdiction. When the business conducted is not of a consumer nature, then all disputes arising under the contract are only to be decided before the local court of law competent for the place of the registered office of our Company. Please be aware, that these General Conditions of Business can change, and that you are responsible for consulting these before placing an order with us. Should you not agree with the included General Conditions of Business, then you should not access or use this internet website. Your order legally represents an offer to us on your part for the conclusion of a contract of purchase and sale, on the basis of these General Conditions of Business, and you are bound by such offer for 14 calendar days thereafter. Our Company is under no legal obligation whatsoever to accept your offer to enter into a contract with us, or to accept an order from you.